The comfort of a house shoe. The stability of a sneaker. 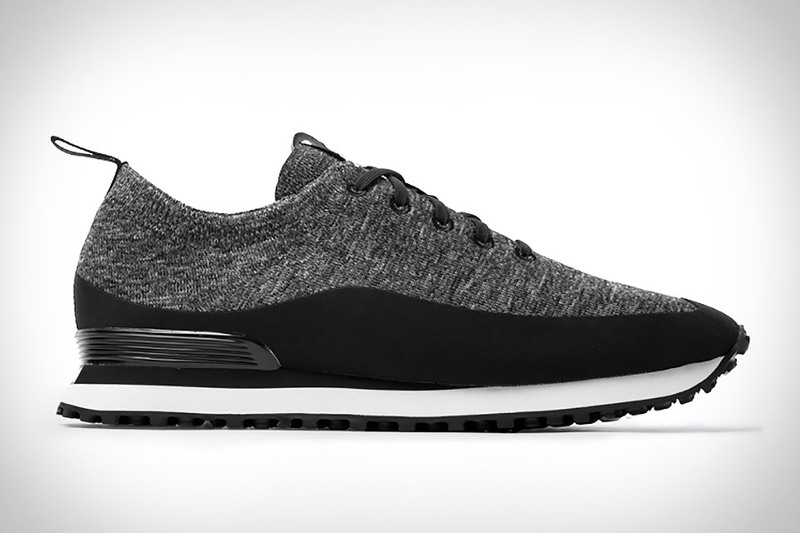 The Greats G-Knit offers both with a breathable, heathered one-piece knit upper, an elastic collar, a welded rand, a molded heel counter, a dual-density EVA midsole, and a Vibram FreeRide outsole. Available in three colorways — Cadet (navy), Cargo (olive green), and Nero (black, pictured). A sneaker, simplified. With an all-mesh upper, a very low curb weight, and a basic design that lets you wear them with or without socks, the Nike Roshe One are everyday shoes that are as comfortable as a pair of slippers. Available in a rainbow of colorways. If there's one way to enhance the already iconic Stan Smith sneakers from Adidas, it's by adding Primeknit technology. These Adidas Stan Smith Primeknit achieve that, with an upper made from one piece of digital knitting technology, providing the ideal amount of flexibility and support you need. Available in all black, with three stripe detail, flat laces, and leather lining. When it comes to iconic American gym shoes, the conversation should always start with the Chuck Taylor All Star from Converse. Almost 100 years since the original debuted, a classic is re-imagined with the Chuck Taylor All Star II. But don't worry, most of the upgrades to these timeless kicks don't compromise the look that has made them famous, but instead add to the comfort of a shoe that's never been known for its cushioning. Under the hood they've added a foam padded collar, a non-slip gusseted tongue, and Nike Lunarlon sockliner support for all the comfort you'd wished your Chuck's owned for years. New Balance continues to meld style with comfort with the Fresh Foam Zante Sweatshirt Sneakers. They feature a lightweight, cozy feel thanks to the breathable sweatshirt material uppers, and are rounded out with vegetable tanned leather accents, reflective New Balance logos, and gum soles. Everyday flexibility collides with performance running technology to create another standout from New Balance. It takes skill to make a monochromatic sneaker stand out. And stand out the Native Apollo Moc does. Exclusive to Kith, this low-cut shoe sports a one-piece microfiber upper with a perforated forefoot for ventilation, plenty of tread, an EVA midsole for comfort, and a casual, slip-on vibe that's perfect for the Summer months. Inspired by the Center Hi of the 1960s, the PF Flyers Made in USA Center Hi Sneaker is a bold mix of the old and the new. The performance cushioning insert and PU midsole are both modern and comfortable, while the 14 oz. heavy canvas upper, leather toe cap and eye row, and pigskin lining are all timeless. Finished with a hand-drawn midsole stripe and debossed ankle patch.